A couple video clips from the DVT Kick-off Event are available online at http://www.prnewswire.com/broadcast/23862/consumer.shtml. I have posted some pictures I took at the New York event here. Please come join ClotCare and the Coalition to Prevent Deep-Vein Thrombosis (DVT) as we attempt to break the world record for the longest kick line. On March 7th, the Coalition to Prevent Deep-Vein Thrombosis (DVT) will lead DVT survivors, their friends and family, DVT Coalition members, and local dancers to "kick off" DVT Awareness Month 2006 by attempting to set the Guinness world record for the longest kick line. The Coalition is conducting concurrent events in New York City, Washington, D.C. and Miami, Florida. The Coalition to Prevent Deep-Vein Thrombosis (DVT) will kick to raise awareness of DVT in New York, NY, Washington, D.C. and Miami, FL. Join the Coalition to Prevent DVT as it "kicks off" DVT Awareness Month 2006! 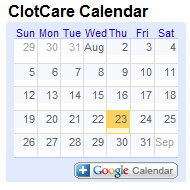 Please feel free to contact me with questions at webmaster@clotcare.com.